Earlier in the month I posted about the threat to Glen Etive from hydro schemes and the need for those concerned to object to the schemes. Since then a meeting of Highland Council has approved the deals. This doesn't mean the end of the campaign. Mountaineering Scotland are asking the Scottish Government to 'call in' the schemes for review. If you live in Scotland you can support Mountaineering Scotland by emailing your MSPs. Everyone can also write to the press about this. 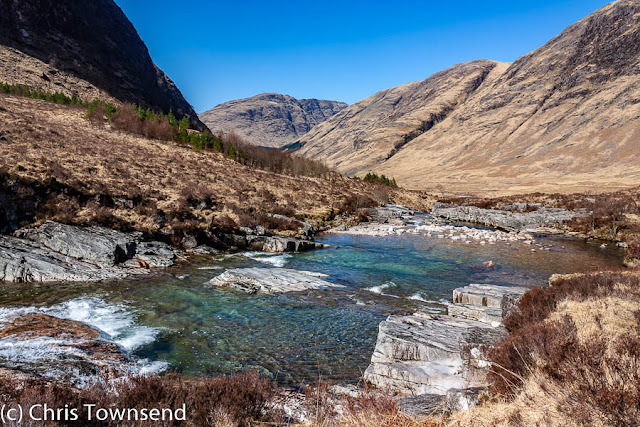 There are more details on the Save Glen Etive Facebook page. Here's the email I've sent to my MSPs. I am writing to support Mountaineering Scotland in asking for the Scottish government to formally ‘call-in’ the hydro schemes proposed for three rivers – the Allt Ceitlein, the Allt a’Chaorainn, and the Allt Mheuran – on the undeveloped south-east side of Glen Etive. This area is meant to be protected from damaging developments as it’s in a Wild Land Area, a National Scenic Area and a Special Protection Area. Surely three designations are enough to protect a place? If not, what is the point of such designations? The small amount of energy produced by these schemes cannot in any way justify the loss of biodiversity, wildness and beauty. This is a special landscape of national importance and is visited and loved by walkers, climbers, canoeists, photographers, wildlife watchers, sightseers and more. Nature and outdoor activities contribute some £1.4 billion per annum to the Scottish economy. Damaging places like Glen Etive does not encourage growth in this sector or the return of visitors. It is disappointing that Scottish Natural Heritage did not assess the impact of the schemes properly. It viewed them as individual applications and not as a major single development that would ruin the character of the glen. The water abstractions from the rivers, the pipes, intakes, and roads will all detract massively from this unspoilt landscape. The developer says there will be full mitigation for the works but has failed to provide convincing evidence for this. Other hydro schemes show that restoration even when done well – and it often isn’t – still leaves scars and a damaged landscape. Highland Council approved these developments but there were strong local objections – the motion to refer the decision to the whole council was made by a councillor from Kinlochleven - and a significant number of councillors voted against the schemes, showing they were concerned about the impacts. Glen Etive is a jewel in the Highlands and Scotland and should be protected as an irreplaceable asset for the nation. With its nature and landscape, it could be revitalised for the benefit of the local community.